Playwright Dave White whose series Last Chance – Tales from a Broken Heartland will be featured as a part of Spooky Action Ranch’s Nurturing New Ideas Series in Austin, TX this March. 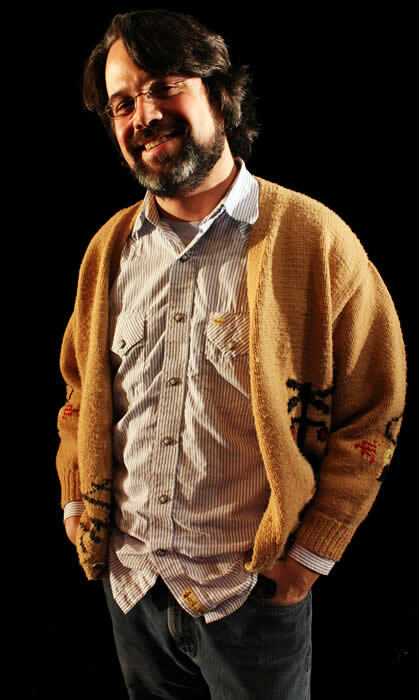 Our very first Artist in Residence will be Dr. David M White. David grew up in the hills of Southwest Missouri. He received a B.A. from New College of Florida before returning to his home state to earn a M.A. from the University of Missouri – Kansas City, and a Ph.D. from the University of Missouri – Columbia. In 2004, he helped found the Generous Theater Company (then Immanent Eye Theater) which took one of the Last Chance plays, Trash, to the 2005 New York International Fringe Festival. Last week I had the opportunity to chat with playwright Dave White about his work and his upcoming workshops of Last Chance – Tales from a Broken Heartland. Last Chance is an ambitious project, can you tell me a little about the origins of the concept? For years before Kevin Spacey identified people’s desire to gorge themselves on viewing a television series, I have participated in “binge-viewing” of my favorite shows (Twin Peaks, Firefly, Slings and Arrows, The Wire) consuming whole VHS tapes or DVDs at a time rather than bite size portions. In 2002, as I was writing Ain’t Nothin’ Quik ‘n Easy and Watersheds, the second and third plays I wrote in the series, I started wondering why I wasn’t finding this same joy in the theatre. Wouldn’t theatre audiences enjoy the longer story arcs and deeper character development that I was seeing in television programs? What if a theatre series focused on a community as a hero rather than a character, would audiences invest/see more deeply into their own communities? If a series of plays was able to gather an audience to see two or three episodes a week, that would create a new community of people, but in life, not just through virtual mediums sharing thoughts and reactions. The theatre serial seemed to combat the consumable and disposable nature of theatre: arrive early to say hello and be seen, watch a show, leave after and perhaps discuss it, but more likely go home and go to be, it’s late after all. I want audience members to invest because they know there’s more to the story to be discovered. What is, in your estimation, the purpose of art? How do you strive to meet this purpose in your own work? I don’t know that art has a purpose, perhaps the artist has a purpose and the viewer has a need and the art is where those two desires have the opportunity to intersect. For me, though, what art achieves, at its very best, is to begin conversations: conversations within myself, conversations among those who have or have not seen the art, and a conversation between the artist and the viewer. Art helps me articulate similarity and difference, complex ideas, and journeys that I have taken or hope to take. In my work, I don’t know that I’m striving to meet this purpose. As a playwright, my job is to provide a window through which other artists can see something and work to realize that vision, but basically it’s my job to make the window. I try to make windows that are interesting to look through, provide new perspectives, or help to see old things in new ways, but the end product of my work is not the work of art (to be in love with the script (or see it as the art) is to be in love with literature and not theatre) …I try and make a good blueprint from which others may wish to make art. You grew up in the Ozarks, what are your current feelings and connections to that part of the country? 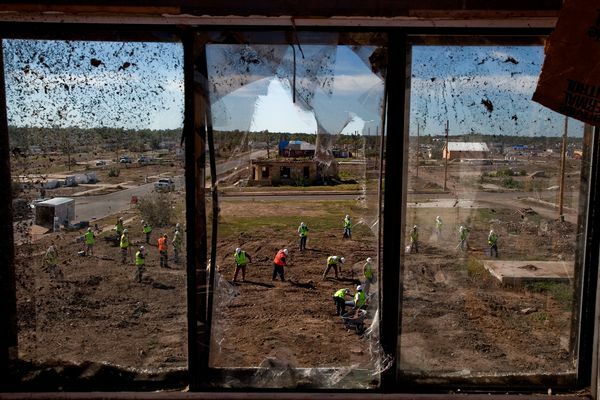 The view of recovery workers out of a window in Joplin, MO following the 2011 tornado. I’m still back there from Baltimore quite a bit, in particular after the tornado in Joplin, where I went to school, I was back working on serving that community by working with a team of students to create a docudrama about how Joplin recovered from the tornado. My family is there, though they’ve now moved off the farm and out of the Ozarks. The Ozarks are one of the most overlooked and underappreciated parts of the world and for that reason its stories need to be told. And they need to be told with a lens that doesn’t belittle. I grew up with Lil’ Abner and the Beverly Hillbillies as the cultural touchtones for the people around me, and I’m thrilled to see films like Winter’s Bone that are capturing the depth of struggle of people in that part of the world. I’m connected to that part of the world, and am an ambassador for it, it has shaped who I am and as I travel and meet more people I find myself more easily connected to them by what I learned in the Ozarks rather than what I bring from the East Coast. What are your hopes for this residency? What are you exploring about the work right now? How this work connects to Austin. I’ve seen these plays in action around the country and in Missouri they’re a bit crude, here in Baltimore they’re a bit quaint, but it’s the combination of those things that I think makes them special. They are emblematic of my effort to understand those around me, but I don’t think they’ve found an audience who can see all of the sides of them, and I really hope that the artists with whom I’m working in Austin can see the amalgamation of elements with which I’m working. Austin feels like a town that understands this sensibility, I guess I’m there to figure out if my gut feeling after a couple of visits is right. As for what I’m exploring, I’m looking at the connections between the plays, and am working toward seeing these plays as a continuum rather than constituent parts. They all have to work, but they all have to work together too. Where do you hope this work will go from here? What is the next step for you? I want to find the people and place in which to present LAST CHANCE. I want to take this ride with an audience. When we’ve done the readings of the whole piece, the audience members that went on the whole journey got a different kind of theatre buzz out of it and I want that to be able to happen night after night not just during a weekend of readings. My next steps are to make this insane project manageable and workable for the team that wants to undertake it. I really want to figure out how it will best translate for the audience its intended: does it need a musical narrator? Should it be fully produced or does it work as a radio play? Should we tour it in a trailer to music festivals? This is the first project I’ve undertaken that feels like it wants to break out of the theatre and the traditional ways of presenting theatre, so I want to do my part to let it live no matter what the venue. Dave will be travelling halfway around the world to Uzbekistan for performances of the Last Chance Series’ play Ninjas and Squirrells as part of an international theater festival. 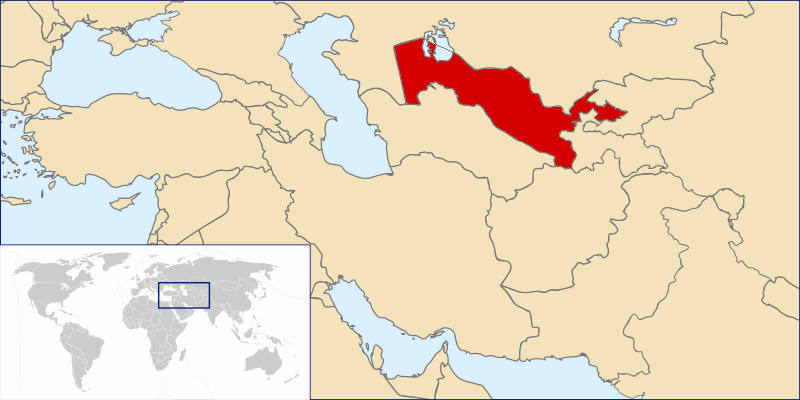 Oh, and I’m headed to Uzbekistan in April with NINJAS & SQUIRRELS, which is one play in the series, so that’ll be another chance to see how audiences from around the world connect (or don’t connect) to this work. Can’t wait to see how that shapes the future development of this work. The Nurturing New Ideas Series will be in March just following the Austin SXSW Madness. There will be two nights of readings featuring four plays in the series. You can find more information about Spooky Action Ranch on our Facebook page, as well as details about the events. ← Is Responsible Food Really More Expensive?